This is a sponsored post from U.S. Cellular. All opinions are my own. Back in 2002 Jacqueline Whitmore declared for July to be Cell Phone Courtesy month. Can you believe that's been 14 years ago we have been dealing with "mobile manners"! There are many ways that you can be courteous to others with your cell phone. 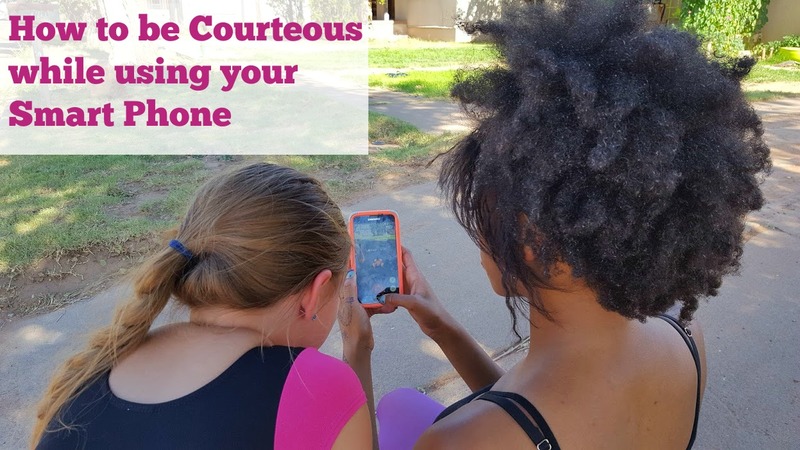 Answering texts and phone calls in a reasonable amount of time is one of the best ways to be polite to others. Another is not sending group texts. I have somehow gotten in group texts of people I don't even know and having to receive so many texts where someone is ranting about their ex-husband, it's not fun! I am a firm believer in people should interact with others and not a screen. My husband and I want to foster / adopt and we have starting making some house rules, as it's easier to enforce rules with children if they are already in place. One of our rules is that people are more important than electronics. If we have family visiting from far away, we won't rent a movie because it is a bunch of people interacting with a screen and not with each other. In the same way, all devices have to be put away during family times. The only exception is if there is a medical or work emergency. Of course, taking photos is fine as well as looking up things such as if the word "AI" is allowed to be used in Scrabble (it is, by the way, it's a type of sloth) But we want to avoid what almost half of smartphone users admit to doing -- checking their phone to avoid conversation. There is nothing better than good conversation with people you enjoy being around, and my husband and I want to make our home where phones and tablets enhance times together, not as a distraction. Being aware of how others will receive your text messages is another part of etiquette. If someone sends you a long text, do you respond with "K"? Most people don't like that or if a response is just an emoji. It depends on who you are texting, of course. Don't forget time zones and to be considerate of when you text -- and something I often don't consider -- when I send Facebook messages. Many people have their Facebook set up to give a sound notification, and it may wake them up if you are a night owl like I am and send a message at two in the morning. I can remember I took someone on a trip one time, and we were in another time zone, and she started getting multiple texts at four in the morning. I finally asked her to silence her phone. She was sleeping through them, but I wasn't, and she wasn't happy I woke her. If people wouldn't have been texting so early for the time zone we were in, we both could have slept soundly until it was time to wake up. One thing that has been in the news quite a bit lately is people playing Pokemon Go and not watching where they are going because they are so focused on a screen. My husband and I have enjoyed Geocaching for years, where you put coordinates into a GPS and find something that is hidden. The difference between that and Pokemon Go is you may be more focused on a screen as you are looking for something digital instead of that is in real life. I'm sure you have heard about people who have been hit by cars or fallen off a cliff. I saw a post from a Facebook friend the other day asking how close she had to get to a landmark because if she was any closer she would be swimming in the fountain. I'm glad she watched where she was going and didn't get wet! It's so easy to focus on something and walk into something you shouldn't. I nearly walked into a wall the other day trying to catch a Pokemon in my home. But, before everyone jumps to say it's just kids who don't watch where they are going, 23% of smart phone users admit to walking into someone or something while on their phone. A few weeks ago, I was on my iPhone 6 while in the grocery store. I have been a coupon queen for over 20 years, and these days instead of clipping coupons, I use apps. I especially love SavingStar because of their "one or many" rebates. I was in the dairy aisle trying to figure out if my purchase totaled $12 so I could get $3 back, and I walked right into someone while I was reading the requirements on the offer! My grocery shopping is almost always done iPhone in hand these days, but since I walked into that lady, I have really been trying to make a point of moving to the side of the aisle and standing still while concentrating on my phone! Sometimes cell phone courtesy and safety go hand in hand. Just yesterday my husband thought someone was allowing him to pull out into traffic, but I'm glad he noticed she just wasn't paying attention because she was texting! He had a car totaled by someone who rear ended him while texting and driving one time. Cell phones are wonderful things and can help bring people together as well as create some fun moments with apps like Pokemon Go where the whole family can try and find the creatures, but with anything with the fun comes responsibility. The whole Pokemon phenomenon would be a great time for you to download the FREE U.S. Cellular Parent Child Agreement and talk to your children and teens about proper use of a cell phone and tablet. I think one important thing is not to call too late. 10pm is a good cut off time. Assume that people might be in bed. I have to agree. Please be respectful when using your cell phone, especially when having a loud conversation in a quiet place or a place where people might not really want to listen to you! These are some great points. I have to admit, I'm guilty of a couple of these. Several months ago, I was at Meijer looking through my Mperks app and almost ran into a lady, thankfully she just laughed. The other night when my husband & I were at a restaurant on a date, I was texting our daughter back about something that could have waited and he got very angry & said it was rude. Those two experiences have made me more aware of my cell phone etiquette. I try to always be aware when I'm on my phone in public. I think people often forget that everyone around you doesn't want to hear your conversation. I cannot believe how rude people can be with cell phones! I work in healthcare and one of my patients texted on his cell phone the whole time I was trying to talk to him. Recently my husband and I went to a barbeque and when we arrived I noticed that about eight people were texting on their cell phones and were too lazy to get up and greet everyone. What is so important that you can't have a normal conversation any longer! When I worked in the drive thru at a fast food restaurant, you wouldn't believe how many people drove up with their phones and refused to stop talking. It is so rude and I'm pretty sure the conversation could wait. I detest when you are talking to someone and they answer the phone. I was brought up to say 'excuse me' . At the very best, they should say 'pardon me' and if the phone call is truly important say excuse me,I have to answer this. Oh, I really dislike when people respond to my long texts with one word or emoji! I try to respond in the same spirit as someone has texted me. I think cell phone etiquette is very important! I do not have a phone so I don't get caught up in being addicted to phones. I do think that phone "politeness" is lacking all around, in so many ways. It would be great if people could detach themselves a bit from their phones at take a look around them. I dislike it when people carry on a long conversation on their cellphones while in a public place or in a restroom and you hear private information that you shouldn't. Also I think it is rude when people answer their cellphones while physically interacting with someone else. For example when someone is in line at the store, the cashier is talking to them, their cellphone rings, and they answer it, totally ignoring the cashier. My daughter makes me fighting mad when she stops mid sentence and begins a conversation with someone around her....I told her I did not like that and that it is disrepectful. She's 17 so her life is busy (rolling my eyes)....I told her I was going to hang up on her...I put up with it and put up with up it...finally, I did hang up on her and it hurt her feelings. We no longer have this problem! It makes me so sad to see families in restaurant and each person on the phone kids on tablets no conversation what so ever - I always think why did they go out - why didn't just order? Oh this drives me nuts sometimes! I get so mad when I see someone driving down the road and looking at their phone. I have a firm rule that when I drive..the phone gets put down and I do not even answer it. Just today I was in line at the grocery store and the guy was talking so loud on his phone. I just dont understand why it could not wait until he was done. Also, try not to call around dinner time. That is one time it should be for family time. Even though I have two teen sons I always say you can talk to your friends later now is dinner time with the family! I use my cell phone sparingly. I'm thankful we have them when we need them, but they can be such a pain. Don't use it in a movie theatre! There are so many things we shouldn't do! I try to keep the phone put away and silenced during dinner/eating out with friends. I also try to not check on the phone when I'm in the presence of another, like a guest/friend, so my attention is on them. I also think people should stop talking/texting when they approach a customer service person/cashier. I think it's rude when people have to talk very loudly on their phones out in public, on a quiet carriage in the train, etc. Also, I think it's polite if people aren't constantly on their phones at dinnertime or even if you're trying to have a serious conversation with them at another time! I find it rude when people don't silence their ringers when they are in a quiet place, like a library, movie theater or during karate belt testing. I make an effort to not look at my phone when hanging out with friends or family. I think it's inconsiderate to be having a conversation with someone while also navigating a phone or other mobile device. Great article - offers some good points and reminders. In addition to appearing rude, being glued to your phone can also be a safety hazard. I have a personal rule not to call anyone after 9pm unless it's important. And if my phone rings after 9 pm, I know it's spam unless the caller id is someone I know. People just don't call late. I dont like it when my daughter or my sister come over and just look at the darn phone most of the time.I dont like talking on the phone so Im guilty of texting. I think at family gatherings the phone should be put away and not taken out. No electronics at the dinner table. Turn off phones before getting in car. Cell phone etiquette is a definite must. As for all of those people playing Pokemon Go, I find it hilarious. Yesterday, my husband and I saw an older couple drive into a fast food restaurant's parking lot, get out of their cars, and start searching for pokemon. I guess it's for any age group lol!